What percentage of the students performed better in Science than in Maths? Give your answer to one decimal place. Answer: 41.2%. The students that performed better in science are the ones above the line. There are seven of those, out of 17 altogether. Using the Table of Joy, the sum to do is 7 x 100 ÷ 17 = 41.2% (to one decimal place). True or false: everyone must have scored at least 50% in Test 2. Answer: False. The highest score you know about is 76. If the range is 40, then it’s possible for someone to have scored 36. Twenty-eight athletes ran the race in rainy conditions. How many of them completed the course in more than 18 minutes? Answer: 7. 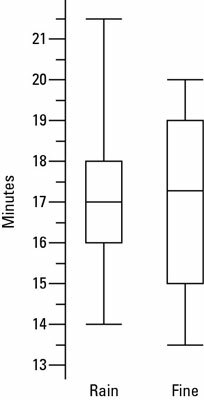 The upper quartile of the rainy race is 18 minutes, so a quarter of the 28 athletes ran more slowly. A quarter of 28 is 7. 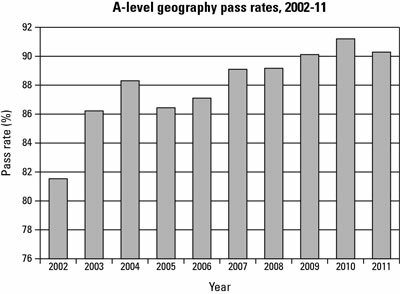 In what fraction of the years was the pass rate greater than nine out of ten? Answer: 3/10. 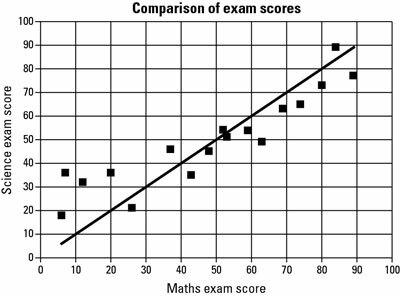 Nine out of ten is the same as 90%, and only the last three years had such a good pass rate. Phones2Go’s share price has dropped by 20% in the last three months. What was the price three months ago? Answer: 31.75. The current share price is 80% of its price three months ago, so your Table of Joy sum works out to be 100 x 25.40 ÷ 80 = 31.75. 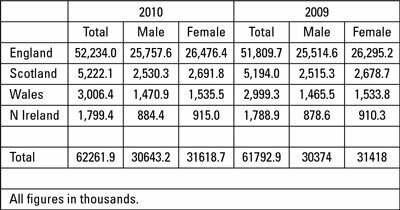 Which region had the highest proportion of females in 2009? Answer: Scotland. To work out the percentage of females in (for example) England, the sum would be 24,676.4 x 100 ÷ 52.234 = 50.75. You work out the percentages for the other countries in a very similar way. The percentages are England: 50.75%; Scotland: 51.57%; Wales: 51.14%; Northern Ireland: 50.89%. What is the ratio of Bob’s regular pay to his overtime pay, in its simplest form? Answer: 7:8. 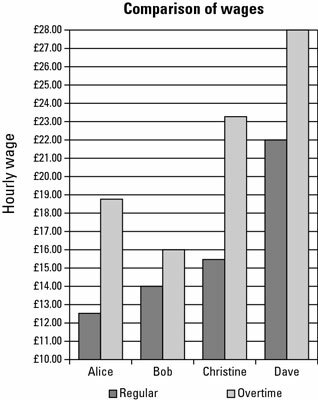 His regular pay is £14; his overtime pay is £16, so the ratio is 14:16; you can divide both parts by two to make 7:8. True or false: on average, Scotland had more hours of sunlight per day in February than England did in January. Answer: True. 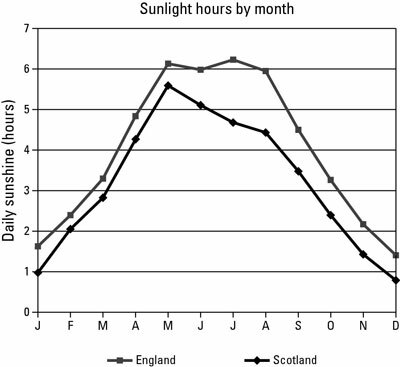 Scotland in February has 2.1 hours of sunlight per day; England in January has only 1.6 hours. True or false: in 2010-2011, more than one in ten classes were rated ‘inadequate’. Answer: True. 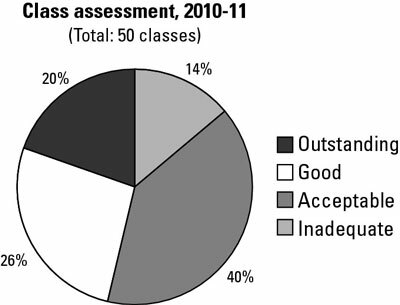 One in ten is the same thing as 10%, and 14% of classes were ‘inadequate’ in the first year. 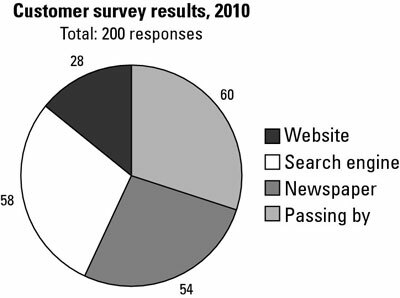 In 2010, what percentage of people heard about the company over the Internet? Answer: 44%. The Internet (website and search engine) sectors add up to 88 people out of a survey of 200. The Table of Joy tells you to do 88 x 100 ÷ 200 = 44%.